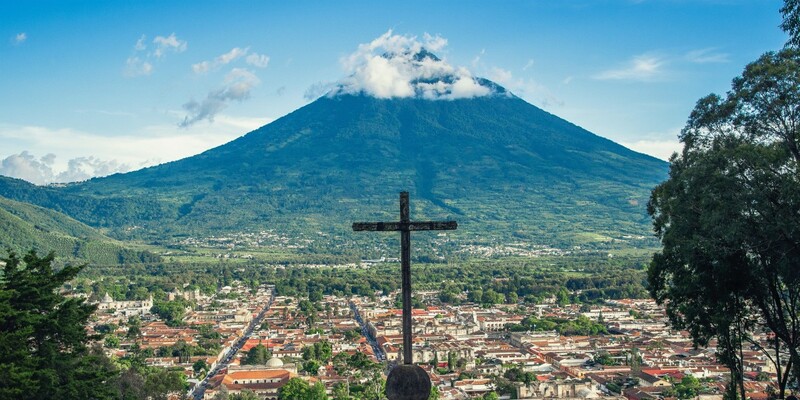 The Aqua Volcano near Antigua, Guatemala has been relatively quiet since the 1500s, when the volcano erupted and sent a a hot mud flow down the slope, killing many in the Colonial settlement. Active volcanoes are located all across the planet. Many of these sites are located far from any sizable population and pose minimal risks to human activity. A scant few of these magma cones can be found near large urban areas and thus pose a high risk for catastrophic destruction should they experience a large eruption. The following is a list of 12 of the most potentially destructive volcanoes that can be found on the so-called Pacific "Ring of Fire." 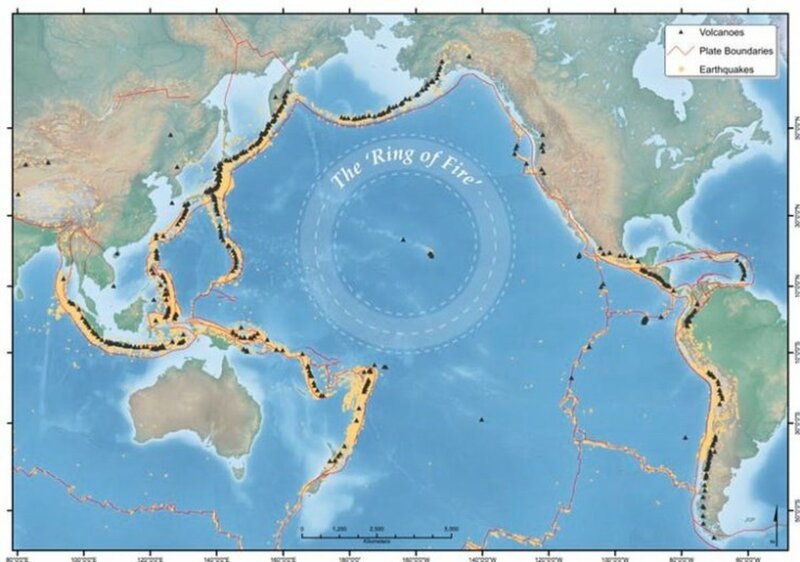 A general map of the Pacific "Ring of Fire." So named for the numerous volcanoes that line the rim of the Pacific Ocean, the Ring of Fire is considered by scientists to be the most seismically active region on the planet. Shaped more like a horseshoe, the "Ring of Fire" is most active along the northwestern segment. Overall, 75% of Earth's seismic activity (volcanoes and earthquakes) occurs within this belt. According to Volcanologist Heather Handley, the Asian island nations of Japan, the Phillipines and Indonesia have the greatest density of people dwelling near active volcanoes. Japan alone is considered to be one of the most seismically active places on the planet. This was made distinctively clear in January 2018, when Mount Kusatsu-Shirane, located near Tokyo, surprisingly erupted, killing one soldier and injuring over a dozen skiers. 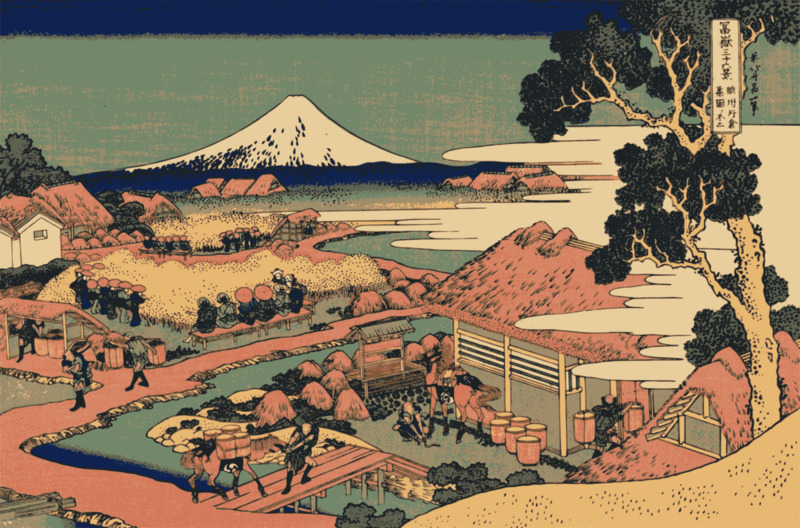 Wood-block print of Mount Fuji by Hokusai. Since Japan has over 100 active volcanoes, modern-day volcanologists have a lot to watch and worry about. High on the list of dangerous volcanoes is the Empire of the Sun's most notable landmark, Mount Fuji. Though this mountain hasn't blown its top for over 300 years, it is long overdue for an eruption. 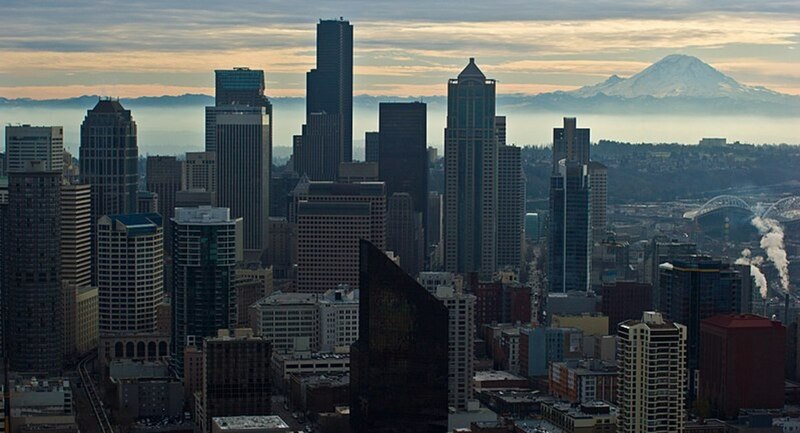 Some scientists are concerned that a large earthquake could trigger this mountain into a spectacular and deadly blast. While Mount Fuji sits quiet, the Sakurajima volcano in southern Japan is a very active mountain that has erupted many times in the last hundred years. Most notable was the 1914 event, where large lava fields flowed down the side of the volcanic cone, creating new land masses, which connected the island to the mainland. A large eruption today would put the city of Kagoshima, where 650,000 people dwell, in serious jeopardy. 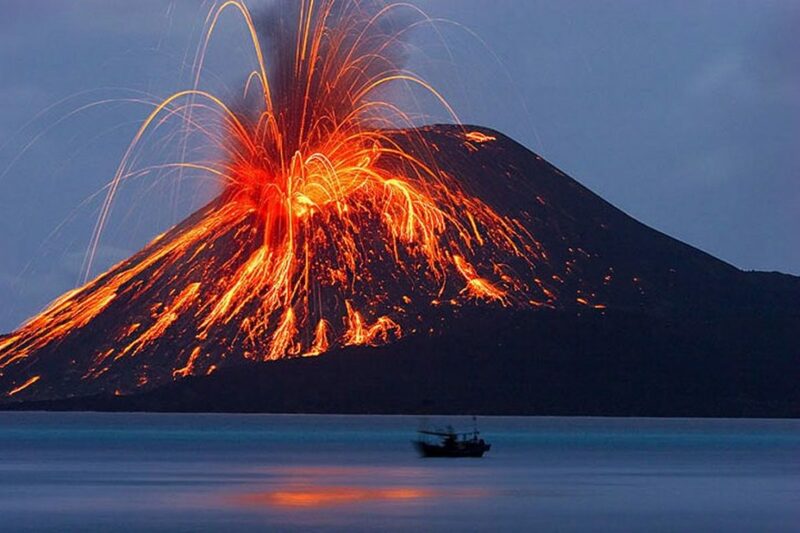 Indonesia is famous for its island volcano of Krakatoa, which blew up in 1883, killing tens of thousands, while also creating a world-wide change in weather that lasted for over a year. Even though Anak Krakatua, the Son of Krakatoa, is back and should be watched, the greatest peril in this island nation could come from a volcano named, Merapi. Meaning "Mountain of Fire," Merapi burst into flames in 2010, killing 350 people and leaving hundreds of thousands without a home. Merapi is located in the center of a rather large island called Java. Like many Pacific nations, the Philippines are a collection of many islands, most of which are home to some sort of volcano. Perhaps the scariest is Taal, which has a large lake nestled in the bowl of its caldera. Located on the main island of Luzon, Taal happens to be located near some substantial urban areas. If a major eruption should occur in the near future, the lake water could mix with the red hot lava, creating an even more massive and deadly explosion. Also of note is the Mayon volcano, also situated on Luzon island next to the Gulf of Albay in a populated area on the southeast corner of the island. 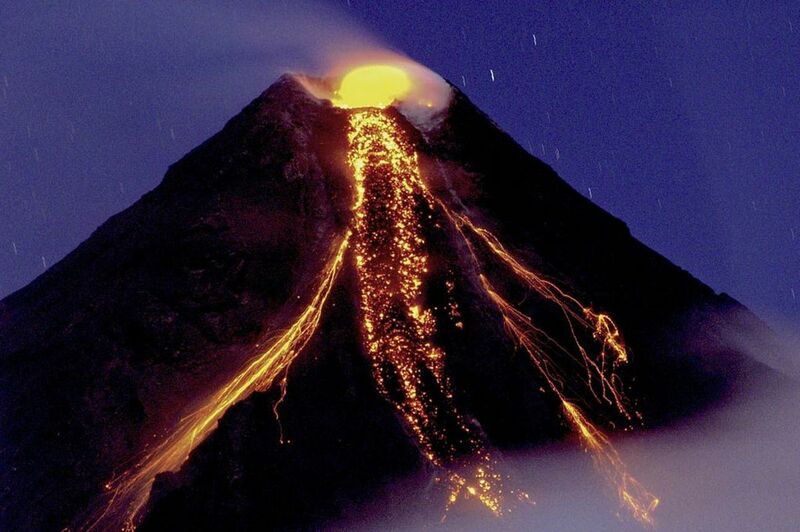 Since the area is heavily populated, eruptions from Mayon have to be watched carefully, especially since this volcano has been very, active in the 21st century. Mauna Loa is the world's most massive volcano. Though the Kilauea volcano on the main island of Hawai'i is currently in a state of eruption, it is not generally considered to be the most dangerous volcano on this set of Pacific islands. That honor goes to Mauna Loa, which can be found close to the city of Hilo, which is also on the main island of Hawai'i. In general, Hawaiian volcanoes produce slow-moving lava flows that can destroy homes and also emit poisonous sulfur dioxide gas. 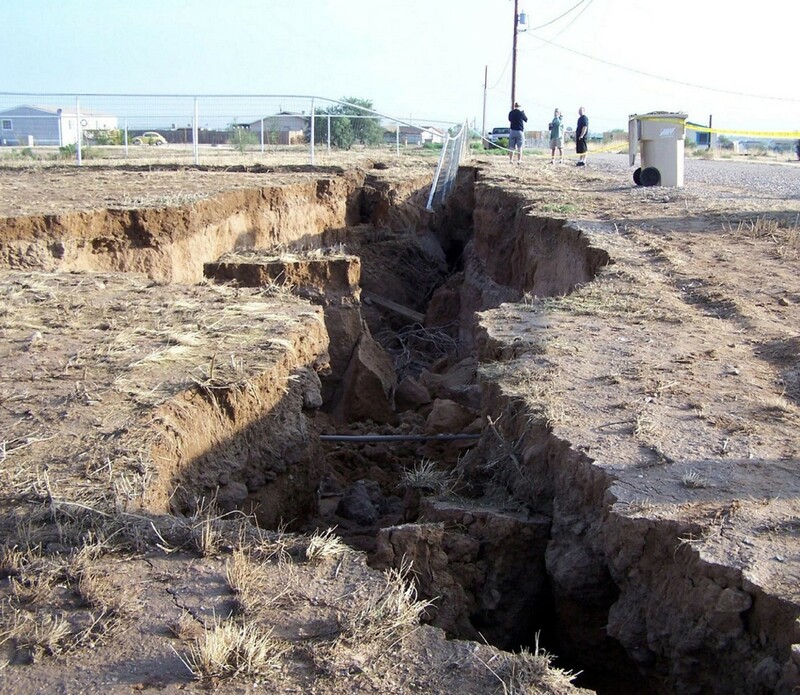 What scientists worry about most are possible earthquakes and tsunamis triggered by an unusually large eruption. Otherwise, Hawaiian volcanoes tend to produce large creeping masses of hot lava and numerous fissures in the landscape, where sometimes poisonous sulfur gases are emitted. Not all the dangerous volcanoes are located in Asia, for there are quite a few in Latin America, where dense population patterns of settlement mirror that of Asia. 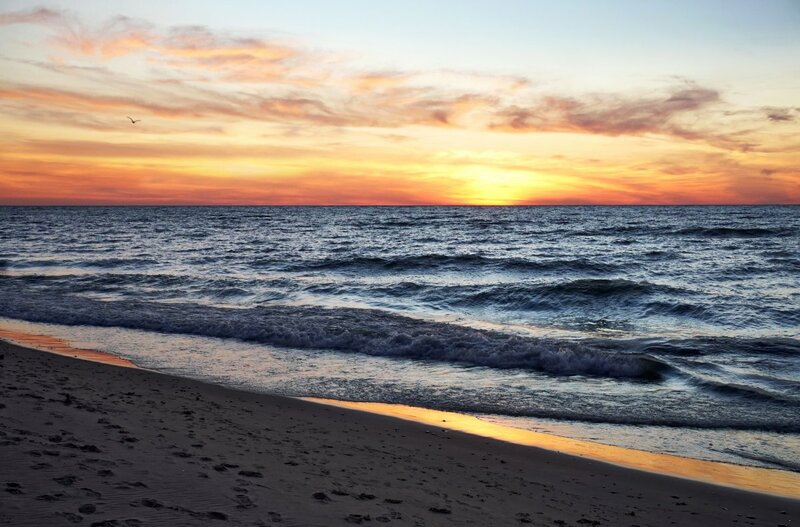 From Mexico to Chile, there are located many of these fascinating hot spots. Perhaps the best place to begin is south of the U.S.-Mexico border, where only 50 miles southeast of Mexico City stands a towering, active, and once snow-covered volcano, called Popocatépetl. The loss of its snow cap is more likely due to an increase in volcanic activity rather than a sign of climate change or global warming. Overall, in naming large active volcanoes, there seems to be a trend where pre-existing native and Polynesian languages are often recalled, while Christian references are few. Of course, there is an exception to this, which can be found in the western Guatemalan highlands near the thriving city of Quetzaltenago, a place where native culture and indigenous languages thrive. 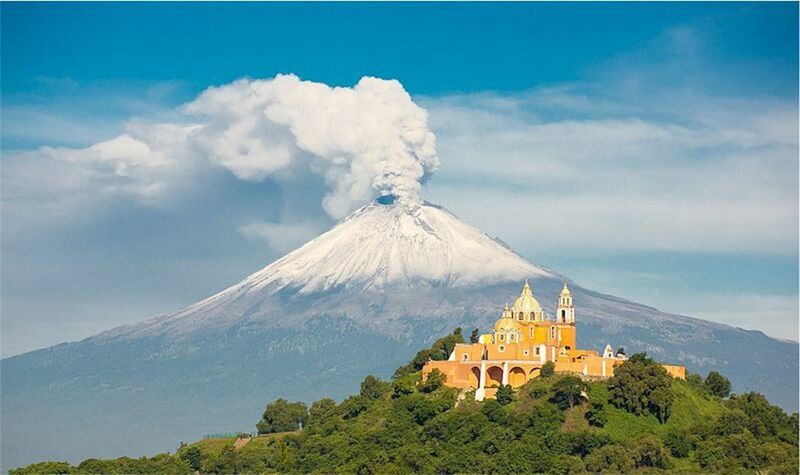 Here, there is a large active volcano called Santa Maria. In 1902, this volcano awoke from a long nap and killed at least 5,000 people with a rather violent eruption. Since that time much minor activity has occurred, but fortunately, nothing that has harmed the local population. Still, Santa Maria should be watched closely. Another major volcanic event could occur at any time. Note: Before the Spanish arrived, this mountain was known in the local Mayan language as "Gagxanul". As one travels south from Guatemala, it seems that every Latin America country that borders the Pacific Ocean has at least one major volcano that dominates the national psyche with its sheer physical presence, as well as an ongoing threat to explode without warning and turn the pastoral countryside into a Red Cross relief district. In Costa Rica, it is the Arenal Volcano, while in Nicaragua, perhaps it is the Momotombo Volcano, which overlooks Lake Managua. 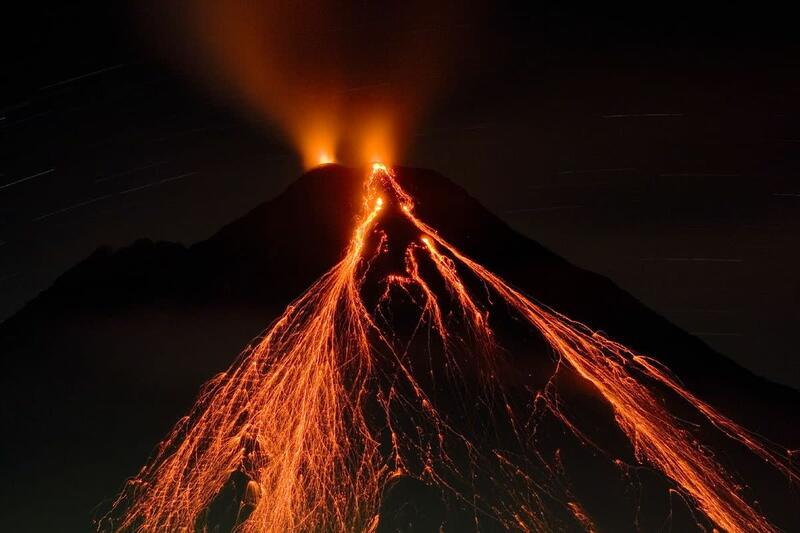 And in El Salvador, a tiny country filled with many volcanoes, there are numerous candidates, such as the San Miguel or Santa Ana volcano. Running south from Columbia south to Chile, the Andes Mountains of South America are also home to numerous active volcanoes. These towering mountains that form the backbone of the South American continent were created when the vast Pacific plate collided with the South America plate. The result is a long range of mountains, home to numerous volcanic hot spots. The Galeras volcano in Columbia is considered one of the most dangerous volcanoes in the region. 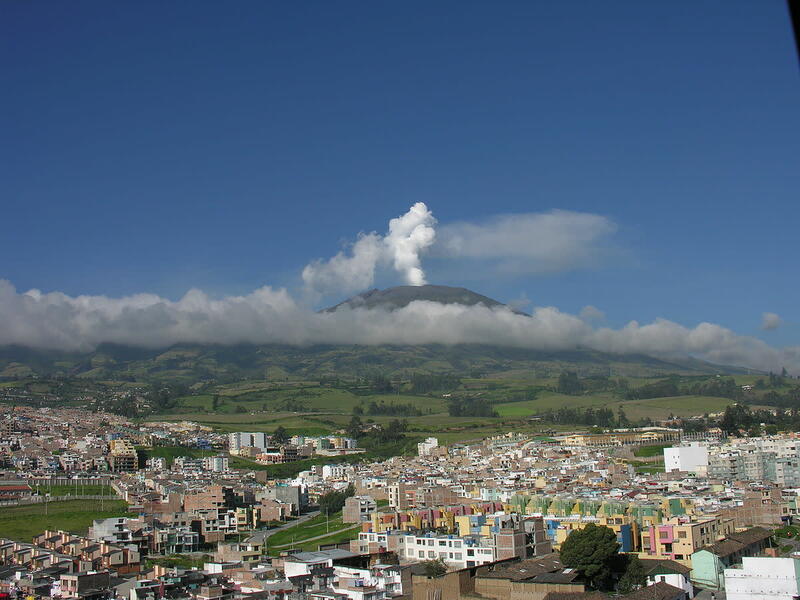 With numerous small to medium sized eruptions in the past fifty years, along with a large nearby urban area of Pasto, this volcano could again explode creating a dire situation in the nearby city. Unfortunately, this situation is mirrored further south in Ecuador, where the capital, Quito, sits in a large valley, adjacent to another active 20,000 foot volcano. This mountain is named Cotopoxi and has long been a geological hot spot in the Andes. Most recently in 2015, Cotopaxi showed signs that it was becoming more active and could again produce a major eruption. Just hours after I published this article, the Kilauea volcano in Hawaii came to life, forcing evacuations. So far, there hasn't been any loss of life or injuries. Though very active, Kilauea is not at all prone to the spectacularly, violent explosions that can occur in other Pacific volcanoes, such as Krakatoa, Merapi or Mayon. Nevertheless, observing the news surrounding Kilauea underscores how intertwined these geological events are with the constantly changing physical landscape of our planet. Kilauea and Mauna Poa are mentioned here because they are situated in the middle of the Pacific Ocean. 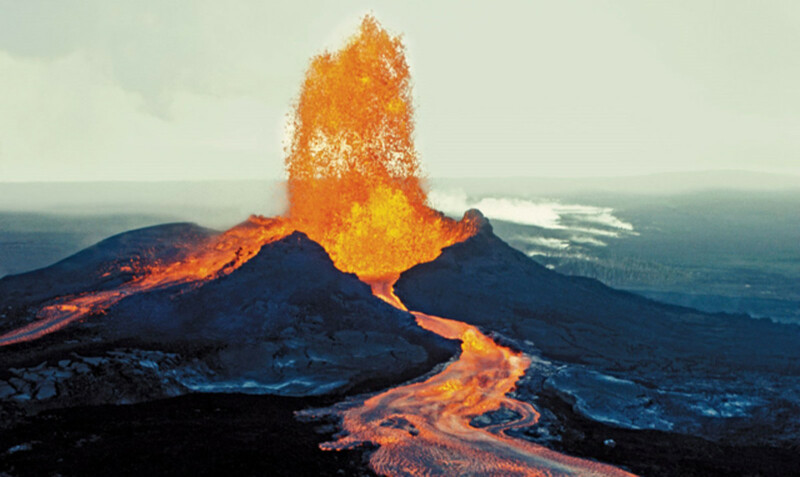 Currently, volcanic activity in the Hawaiian Islands is not always considered part of the "Ring of Fire" because the driving force is not plate tectonics, but rather, the eruptions are the result of a geothermal hot spot that lies underneath the Aloha State. What is the difference between a hotspot and tectonic plates? On our planet, there are many places, where the underground magma finds a way near to the surface of the earth. Often, these places of lava intrusion are created by tension between two tectonjic plates. Furthermore, the collision of tectonic plates can create a column of hot lava that is very similar to a hot spot. 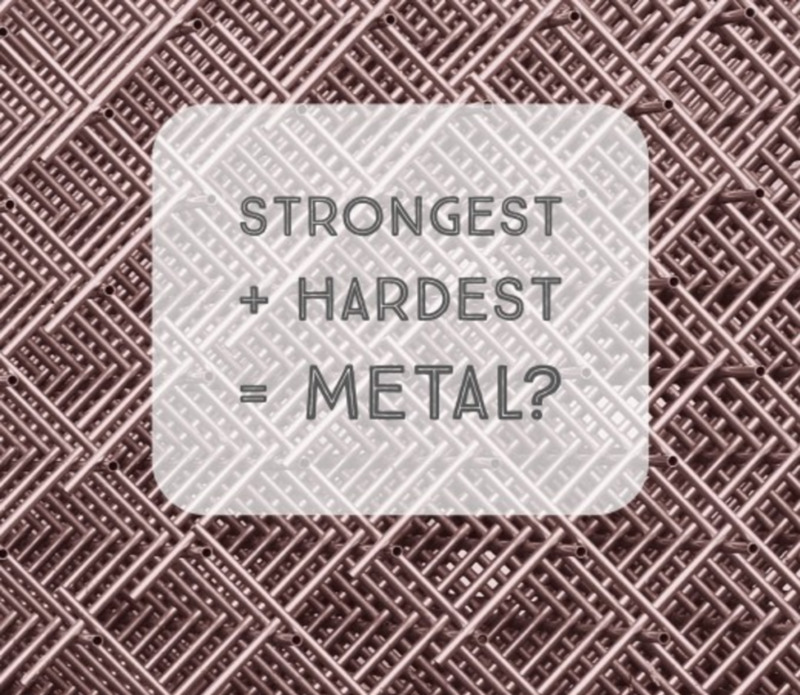 The main difference is the mechanism behind the rise of lava. A hot spot has no known mechanism, it is just a result of uneven distribution of hot magma under our earth's surface. Why do the Hawaiian volcanoes such as Kilauea and Mauna Loa produce a large amount of flowing lava? When was Diamond Head's last eruption on the island of Oahu? According to this source, the last eruption at Diamondhead occurred somewhere between 70,000 and 5000,000 years ago. I know this is a wide range, but scientific inquiry is surprisingly vague. The same article goes on to say that a new eruption is not impossible, just highly unlikely. How are hot spots formed? And how long can hot spots last? The way I see it, hot spots are just irregularities in the magma field that exists underneath the earth's crust. They are a natural state of affairs. Having a completely uniform magma field with no hot or cool spots would be unusual. 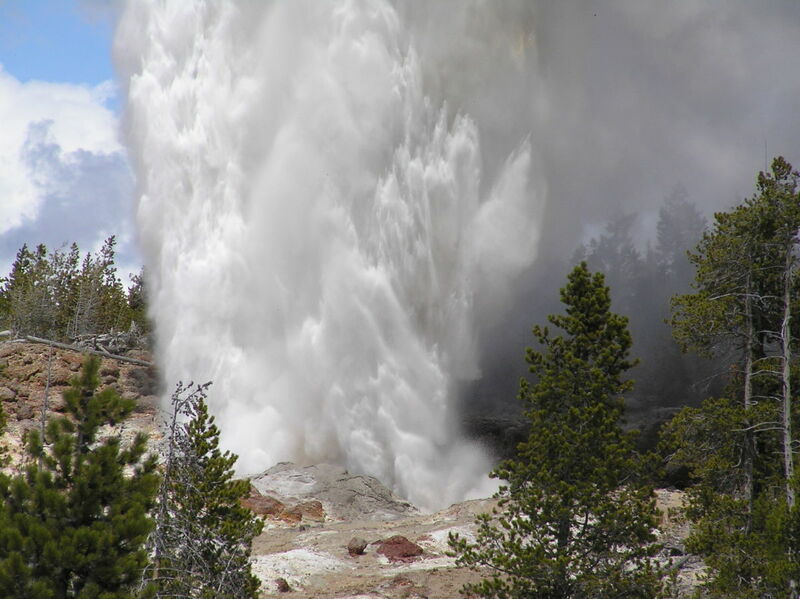 Underground magma becoming superheated and as a result turns to a very active liquid state. Movement of tectonic plates are often the cause of superheated magma. Is Mt. Kazbek in the ring of fire? Mt. Kazbek is an extinct stratovolcano in the nation of Georgia that is no on the Ring of Fire. 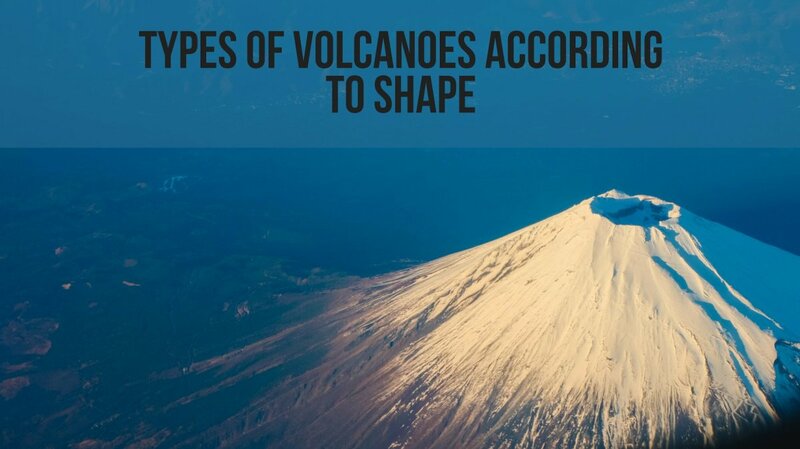 An effusive volcano is one, which instead of exploding in a violent manner, constantly emits a low level of hot lava. Furthermore, the flowing, low-viscosity magma contains small amounts of gas. Kilauea in Hawaii is an example of an effusive volcano. There are many places in the world, where large populations dwell close to potentially-dangerous volcanoes. The unpredictability of these eruptions might have something to do with the way things are. By the way, one of the scariest scenarios exists in Italy (not part of the Ring of Fire), where the old Pompei volcano, which has recently shown a few signs of coming back to life is surrounded by a dense urban population. To think that people co-exist with the volcanoes on their islands, knowing what they know and not being scared (or are they?). Thanks for all this information making us even more aware.